Care for some bass anyone? 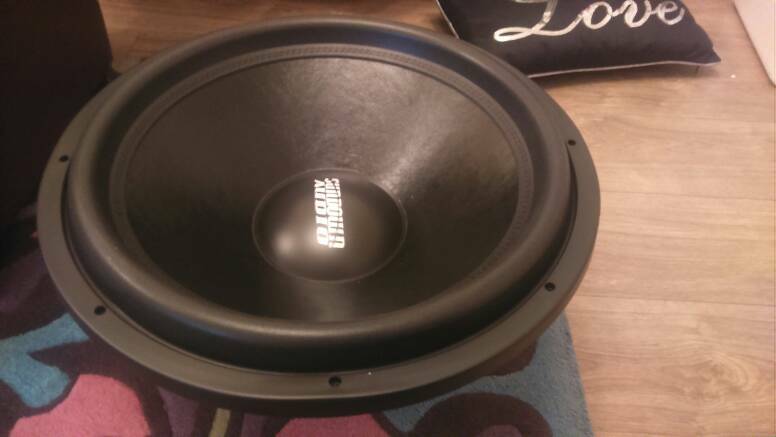 Okay so my Mum's fiancé decided to buy an 18" sub as a project for his car, a Suzuki Swift Sport. Much like me, he's a big fan of bass and loves his music. Here's a photo of the monster. Yes. That's going in his car boot. I don't know how it's gonna fit since you can't even fit your shopping in it. 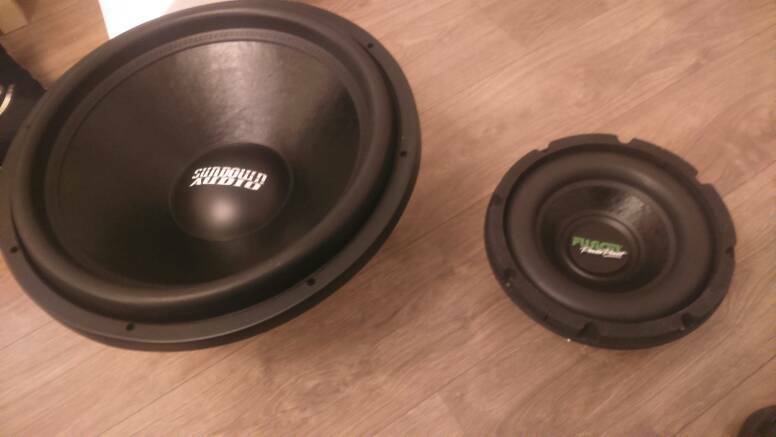 A photo of the monster next to a 10" sub. I'll be posting any progress here as I'm gonna make this a bit of an update thread on how things go. 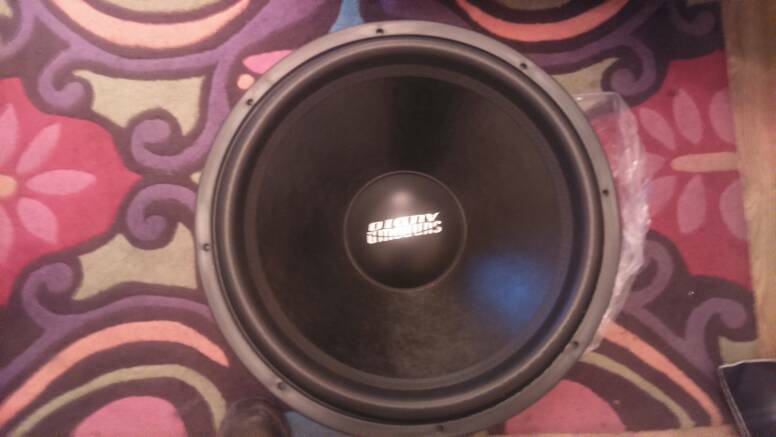 This will be one of the biggest Subwoofer projects I've ever helped someone do. I'll also be taking a few videos of when it's done and posting them in this thread. Right now, we're trying to find out how to make this monster work without killing the car I.e shattering the windows. It's happened before and we don't want it happening again. We'll also be stripping the interior and applying dynomat wherever it will go. Dynomat is a sound proofing, one of the best in the area. This is to prevent any major rattling and will stop bass escaping the vehicle. For anyone who actually had any interest in this thread, sorry for the lack of updates in this. I've been busy doing stuffs. 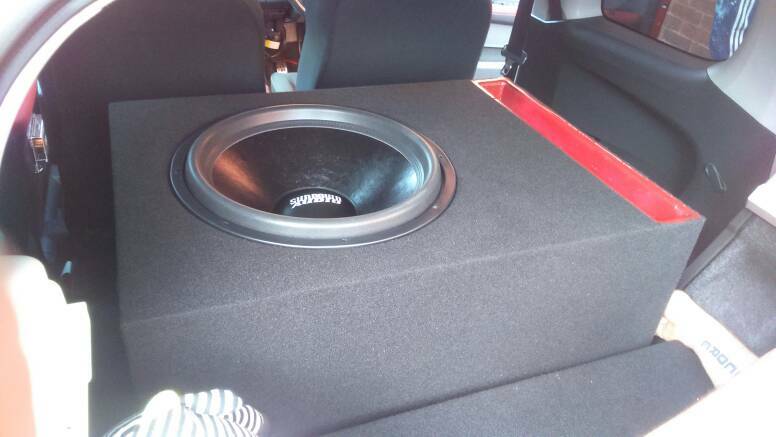 So since I posted this thread, the box has been made and wrapped in carpet, the dual amplifiers have been fitted and wired in and the wiring itself is now fused to the car loom. The sub has been fitted and wired in. The build is currently being tested and tuned as I write this. I'll upload a video soon. But we're far from finished yet. Once the tune is complete we still need to dynomat the whole interior and scope the sub so we can alter where the bass actually goes. The scoping is going to be done by Stephen Harrison who recently hit the world record for the most decibels in a car (160.02) which is insane! In a Renault Clio too! So we run into a few issues with the build, mainly the box itself. So we went to see Ste Harrington (not Harrison I'm sorrynotsorry) and we realised that despite the box covering the boot AND back seats (back seats have been removed due to size), it's too small for the subfwoofer. So what did we do to solve that? Well for now we've inverted the sub so that the magnet is exposed. I never knew something like that would actually make a difference but holy crap. A difference it makes. Dynomat has been applied to the boot. Just everywhere else to go. Still don't have a video. Soz.